Had a busy week around here so the last posts have been short and to the point. The windows you see here are not anything uncommon. We find buildings pretty regularly that have what appear to be windows but do not end up being usable. This post was just to show a couple of the better ones that we have found. It is a good reminder of the types of hazards we can find when we are out walking buildings. This first picture only has an exterior view of the building. It is easy to see that instead of filling this exterior wall in with brick, the occupant decided to just frame right over the existing opening and cover it with drywall on the inside. There was no obvious signs of any windows in this room but had multiple openings on the outside. The second set of pictures has a reverse problem. The outside has been covered over, and if you look close you can see the outlines in the material showing where the old windows used to be. However on the inside if you were in need of an exit point you would still identify these windows as your closest egress. It has blinds, glass and window security bars still in place. Even if you were able to get through the bars you would then find the exterior wall of the building. This window was high off the ground and would be your least effective way out of the building. All the windows had been covered up in this fashion. Nothing big, just something to look at for the week. This is a great example of knowing our still districts and the areas that we know will present unique problems when on fire. As you can see this building presents a nightmare of a stairwell, especially if the stairs are a target of arson or lower apartments begin venting fire and smoke into this common area. We can almost count on occupants hanging from windows if the fire is anywhere near this area of the building. Thanks goes out to 4’s for the write-up and pictures. This is in 4’s still district just above Motor City. There are several apartment buildings in this complex (at least 10) and they are paired in sets of two. This is the center “web” of stairs that connects one building to the other and is the only way out for most of the residents. So which way is up? Good question. The fact is every stair maze is different. In most cases in order to get to the top floor apartments you first must go down at least one flight of stairs, over and back up at least one flight of stairs to get to a pathway that subsequently leads you to the right set of stairs to make it to the top(Sound like a maze?…It is). How do you get down? Well the answer is about the same as above. There is no direct pathway to the bottom level and what you thought would have been the bottom may surprise most people to find at least one unit tucked to rear of the structure. How is this complicated stair structure supported? The only main walkway is a single twin tee concrete beam supported by concrete posts and some posts are supported by steel box supports. From this center piece, all of the paths are constructed almost as if they are built to access only one or two units before a different path is constructed. As you can see, ladder access is difficult at best. To get from the parking lot you almost always have to go down hill to get to the building. You would think there is road access from the “C” side of the structure because of the two plugs back there, however access is minimal because of the off road conditions you would encounter to reach the hydrants, and thats if they are even working. Because of the grade/terrain ladder access from the rear is down to 35′ or 45′ ground ladders and even those can only be used in a few places due to the terrain. The building does have some pull stations but it is not monitored and still requires someone to dial 911 before the FD will receive any info that there is a fire at this building. Throughout the maze of stairs you will find BBQ propane grills, spare LPG bottles, trash and gas meters all tucked away into any area that is protected from the weather. 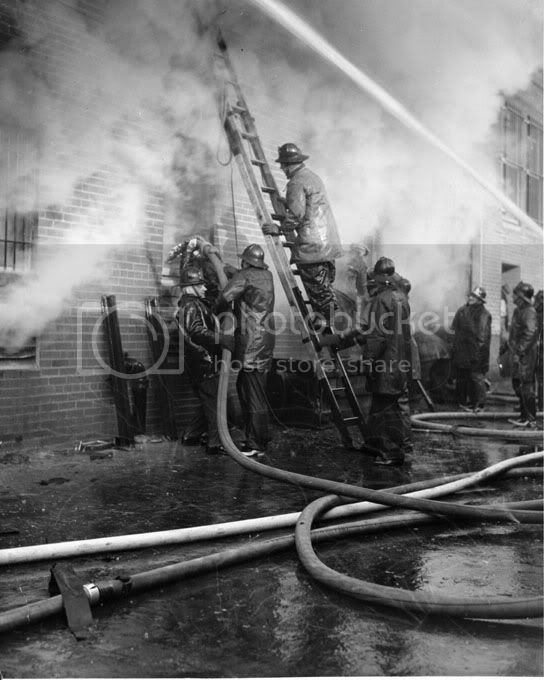 What is your thoughts?…..1st floor fire vs 3rd floor fire, ladder rescues, first line, stretching the line, search. We sent this in to the website VentEnterSearch a couple years ago when it was initially posted. We felt is was time to show it again on our site for anyone that did not see it the first time. This is a great example of the types of hazards that can be found around your district. These first two were found in an alley of two different ordinary construction buildings. However these types of door hazards are not limited to the older downtown and westside neighborhoods of our city, they have been found in many other neighborhoods including newer commercials on the far east side and post-war buildings in the Southgate neighborhood. You can see that the doors on the left open up to a fire escape, but on the right open up to a free fall that could be from the 5th story. The only thing preventing you from falling when the door is open is a small bar that is at chest height. This next door is on the 3rd story and as you can see was open while taking the picture. They more than likely open this for ventilation in the summer. Again the only thing stopping you from falling out of this door is a 2×4 across the opening. We will never find all of these hazards before a fire happens, but staying heads up and keeping our eyes open will keep us that much more ahead of the game. Are there any doors to nowhere in your district? When a three story apartment building with a flat roof begins to leak the owner must fix the leak if he wants to keep his residents. When a building ages to the point that patchwork will no longer suffice, the owner must decide whether to move the third floor tenants to another building or to a lower apartment so that proper repairs can be made to the flat roof. Another decision that can be made is to build a peaked truss roof above the existing flat roof; no tenants will have to be displaced and therefore no money will be lost in rental fees. These peaked rain roofs pose serious concerns to firefighters, not the least of which are the added void spaces and the increased difficulty in vertical ventilation. The interior crews should expect to spend some time in a high heat and smoky atmosphere due to the extended time that it will take to ventilate this structure. The Truckies on the roof should be alert to what IS NOT coming out of the ventilation hole (smoke and fire)! Because of the added void spaces, an extended overhaul should also be expected. Both void spaces (cockloft and attic) should be investigated and cleared of smoke and fire. From the exterior of the building you can see that the outline of the flat roof is visible. This may be a way to recognize the possibility of a rain roof, however the only way to know absolutely, 100% that there is a rain roof is to pre-fire plan the buildings. Even if you have been told by someone you trust that a certain building has a rain roof, you should get up there and see the construction for yourself. Plan out the types of ventilation and the tactics before the fire, and when the fire happens, surprises are minimized and efficiency increased. As you can see from the picture above, the load of the rain roof is carried by a truss system. The trusses run from soffit to soffit, in this system the trusses are set approximately four feet apart and are offset. If you look closely the truss system consists of half trusses and alternates from center to the right soffit, the next (four feet away) from center to the left soffit. The trusses are tied together with a lightweight 2x6x8, connected to the trusses with metal joist hangers. Note that these 2×6 members run lengthwise and are spaced about 20 inches on center. The trusses are held off the flat roof by placing them on wood scraps and fastened to the flat roof by metal hurricane straps and screws. The new roof is then sheathed with OSB or plywood, a layer of tar paper, and topped off with asphalt shingles. When we think about a normal (4×4) ventilation cut, it usually starts with the top cut (to find the trusses/rafters, then the far cut, the bottom cut, lastly the closest cut, the cut is then louvered vertically (peak to soffit). With this construction, if you start with the top cut (looking for the truss/rafter to gauge distance) you will not run into one unless you got lucky enough to plunge close to the truss (remember, they are 8 feet apart). Your next step being the far cut would normally be an easy, unobstructed cut, however with this type of construction you will note the saw bog as it hits the 2×6. If you did not get a chance to pre-fire plan this building, your confusion on the roof will begin to creep in at this time. After completing your cuts, you will notice that the louvers will now run lengthwise. The cut is completed and your work on the roof is done! Well maybe! Everything that is done on the fireground is done for a reason. Ventilation is a perfect example of this rule. Generally speaking, ventilation is done to remove heat and smoke to allow the Engine Company to find and extinguish the fire quicker, to give any possible victims a chance of survival, and to reduce smoke and fire damage. Why do we choose to vertically ventilate as opposed to horizontal/PPV? We have all been taught that any extensive top floor fire with a possibility of extension into the attic space or cockloft should be vertically ventilated to keep the fire from extending horizontally in the void spaces. If we have a reason to vertically ventilate, then we should have some expectation of what should happen after we ventilate. In this case we would probably be expecting smoke or fire to immediately ventilate from the hole. If what we expect does not happen, red flags and alarm bells should be going of in our heads! Something is very wrong and could mean the danger is increasing for everyone on the interior. I personally have not been placed in this situation (ventilating a rain roof), so I will have to refer to those with the actual experience of operating on this type of roof at a working fire. However, I would immediately begin thinking that horizontal /PPV should be heavily considered. By the way, before you get to far into the process, communicate to the interior crews and the IC that ventilation will be delayed at best, or that horizontal/PPV is a better tactic to go with. A few years back there was a fire in an apartment building that had a rain roof. As I understand it Truck 8 was assigned to vertically ventilate. Lt Chapel was on scene and he advised that their main job was to force through a draft stop and extinguish fire in the attic void space. Maybe, he and others that were there will be nice enough to fill us in on the story and provide us with some first hand knowledge. Lt. Garcia has a great deal of knowledge in building construction and his trade of fighting fires. He still considers himself a student of the job and pursues being a master of his craft regularly. Lt. Garcia has been serving for the last 16 years and has spent most of his time in some of the busiest companies on the southside of the city.